Ideally, every patient would be able to live a self-fulfilled life without having to grapple with the pain and difficulty caused by a less-than-perfect tooth at one point or another. Here in reality, though, Dr. Boehmer offers a wide variety of restorative services that are specifically designed to help ailing smiles recover from infection, physical trauma, and even tooth loss. Her treatment solutions are always 100% customized, clinically excellent, and reliable in lasting ways. Don’t wait if you’re struggling – contact our Albuquerque, NM practice today. Why Choose Us for Restorative Dentistry? 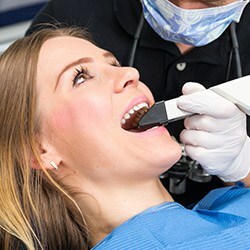 Traditionally, dark-colored amalgam was the material of choice for repairing the damage caused by cavities – many older patients likely still have some of these fillings in their smiles. 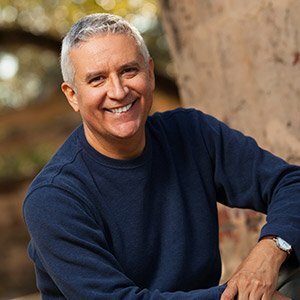 Dr. Boehmer now offers tooth-colored fillings as a worthwhile alternative that are far more aesthetically pleasing and comfortable. Made from composite resin, they can be precisely matched to your smile’s natural shade. The lack of metals also means that they won’t have strong reactions to hot and cold temperatures. 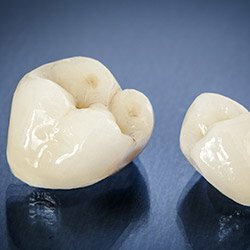 Dental crowns (also known as “caps”) are highly versatile dental restorations that are designed to cover the remaining structure of a decayed, damaged, or otherwise incomplete tooth, both protecting what remains and rebuilding its original shape and strength. They can also be used to protect teeth treated with root canal therapy or restore lost teeth that have been replaced with dental implants. When possible, Dr. Boehmer strongly recommends the use of ceramic materials for an attractive and confident result. 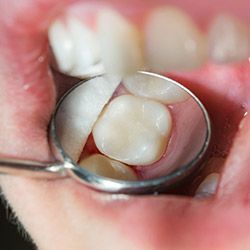 If dental damage is too extensive for a filling to treat but not quite severe enough that a full dental crown is required, inlays and onlays can often serve as the ideal “in-between” solution. They’re crafted from high-quality dental porcelain and are designed to replenish the dental structure’s appearance and range of function. Inlays are specifically designed to fit within the cusps (raised bumps) on top of the tooth, while onlays fit over one or more cusps. When working with a dental laboratory, the creation of a new, custom-made dental crown will always require at least two appointments. Thankfully, Dr. Boehmer has an alternative method available for patients who consider speed a top priority. Our modern practice features CEREC and E4D technology, both of which are capable of streamlining the creation of a new crown down to a single appointment without sacrificing the high level of detail and quality that our practice is known for.